Sassuolo, March 2, 2018 - The Fincibec Group will participate in Coverings 2018, the most prestigious event in the North American sector, to present new collections and innovative solutions that feature ceramics in an increasingly central position: a true connection between project, matter and architectural creations. From 8 to 11 May, Monocibec, Century and Naxos, the three companies of the Group, will showcase their respective catalogues at the Georgia World Congress Center in Atlanta (USA), at Hall B3, Booth #1917. The new Monocibec projects are called Charisma and Charm, which are refined interpretations of natural elements such as stone and wood. Charisma features five stones of different origins, united by exclusive colouring and refinement of its texture. Two finishes are offered: natural, reminiscent of the floors made with artisanal techniques, and lapped, with an antiqued surface that is elegant and rustic as if it were a valuable material rendered unique and special by extensive use. Charm is a functional and versatile offering inspired by the phenomenon of coloured parquet, with a colour palette that can be used in sober and minimalist environments as well as in spaces used for comfort and hospitality. 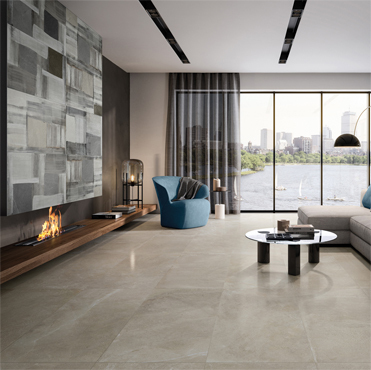 The new Century collections present themselves as a second skin for contemporary architecture, starting with Titan: inspired by metallic and cement surfaces, it contains the strength and suggestions of iconic materials in creating contemporary design. A dominant element or synergistic component of interesting coexistences between materials, colours and design, the aesthetics of Titan are appreciated through an extraordinary choice of formats that support numerous possibilities of use in residential, public and commercial contexts. 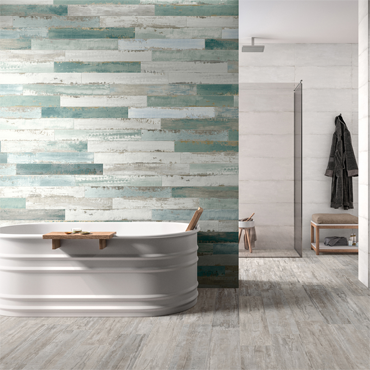 The Royal Wood project recreates four wooden essences in porcelain stoneware, unique combinations of colours and veining rendered current with a soft and elegant grain. The range of slat sizes allows for the most common laying patterns of natural wood floors to be reproduced, and to experiment with original walls with the inclusion of exclusive vintage-style decorations. The elegant and refined style of Naxos is also seen in new solutions for covering contemporary living spaces, such as Flair and Alloy. The Flair collection is inspired by the charm of used materials, particularly wood, which is a recurring trend in interior design. When painted and subsequently modified by time and wear, its small scratches, chips and alterations in colour are transformed onto every slab. The Alloy project focuses on metal that is processed, embossed, etched, and transformed by its union with other metals or oxidising substances, capable of revealing pleasant chromatic variations and original refractions of light. The new large Fincibec slabs in 160x320 and 120x260 cm formats will also be present at Coverings 2018. They are ideal for appreciating the different material-based inspirations and evaluating the use of large sizes in contexts other than for traditional wall and floor coverings, thanks to the possibilities of transformation and customisation for furnishing elements as well as kitchen and bathroom countertops. Among the proposals on display will be outdoor solutions Major by Monocibec and TWO by Century with a grip finish and 20 mm thickness, with an updated and expanded range to meet the needs of a market that shows an increasing interest in outdoor design.